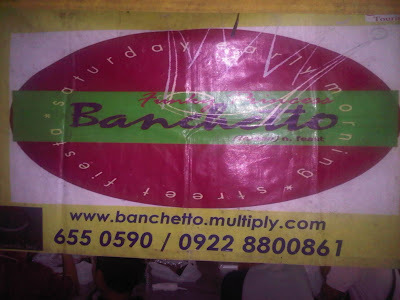 Banchetto, an Italian word that means "Feast", has been around for a few years now. I was able to get the experience of eating in one of their branches back in October 2010. As I mentioned in my previous blog entry, they are opening a new branch to complete a whole weeknight of street food fiesta. If you want to join the fiesta and become one of their vendors, please contact their home office at (+632) 6550590 and mobile nos. (+63922) 8178910 or (+63922) 8800861, or you can email them at info.banchetto@gmail.com.